Kinematic GNSS surveys can provide a rapid means of collecting widely distributed, high-precision topographic data. The advantages of this technique over optical instruments such as a total station are that it only requires one person to operate and it does not rely on maintaining a direct line of site. Once points are collected, students will learn to interpolate them using ArcMap to create a continuous model of elevations. Students must think carefully about where they collect their points and evaluate the merits of different interpolation techniques including TIN and Kriging. Through a field-based application of kinematic GNSS, students will design and conduct a topographic survey and interpolate collected points to create a continuous elevation field. This builds upon skills learned in Unit 2 and prepares students for future techniques such as surface differencing and topographic change detection (Unit 2.2). Note: Although the term GPS (Global Positioning System) is more commonly used in everyday language, it officially refers only to the USA's constellation of satellites. GNSS (Global Navigation Satellite System) is a universal term that refers to all satellite navigation systems including those from the USA (GPS), Russia (GLONASS), European Union (Galileo), China (BeiDou), and others. In this module, we use the term GNSS to refer generically to the use of one or more satellite constellations to determine position. 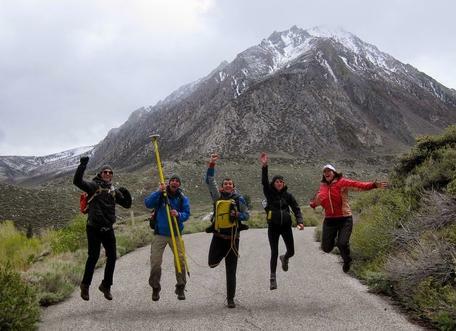 Students from an Indiana University field course jump for joy over their GNSS survey. Students can, in a group, design, conduct, and analyze a kinematic GNSS survey intended to model a topographic surface via interpolation. Students understand how sampling design (where points are collected) can affect the efficiency of field work and the quality of the surface model. Students can implement several interpolation techniques in ArcMap and discuss their various merits. Students can apply findings from a kinematic GNSS topographic survey to an issue important to society. Cognitive: Pre-fieldwork reading and discussion helps students recognize how spatial interpolation techniques work. This informs their survey design and workflow. Behavioral: Help students gain hands-on experience in designing and executing a survey as well as interpolating points into a topographic surface using ArcGIS. Affective: Facilitate student learning that where points are collected and which interpolation technique is used affects the modeled surfaces. If points are not collected carefully, the surface may be inaccurate, with implications for hazard assessment, volume estimation (water resources, stockpiles, etc. ), or other human endeavors. This kinematic GNSS unit is appropriate for upper-division geoscience, earth science, geography, or civil/environmental engineering students who have already been introduced to basic concepts such as plate tectonics, mass movements, and hydrology. Students should also have a first-order familiarity with uncertainty, precision, and accuracy. Appropriate for academic year courses with field components or a summer field camp. This is an advanced unit within the field-based kinematic GNSS series and assumes completion of Unit 1: GPS/GNSS Fundamentals and Unit 2: Kinematic GPS/GNSS Methods. Students should already be confident in working with kinematic GNSS hardware from Unit 2. The unit should require ~30 minutes for the initial reading/lecture and discussion, ~3 hours for survey design and implementation and ~3 hours for surface modeling and interpretation. Instruction can be done in a single day or split into two sessions, one for the survey and one for processing and analysis. Although this unit provides instruction on interpolation of the collected points and visualization of those surfaces, if ArcGIS/computer skills or availability are an issue, this work can also be largely demonstrated by the instructor and the results can be forwarded to the students for interpretation. An instructor presents students with one or more field areas and asks them what would be the best design for a kinematic GNSS survey to efficiently and effectively measure a topographic feature of interest. Is gridding the area with points a good idea or should collection be more strategic? Students first work individually, then come to a consensus on survey design as a small group. The survey must employ appropriate techniques and methods as outlined in previous and current units. Students implement their consensus survey design in a field environment. Students are in charge of all aspects of the deployment, from packing equipment to setup, surveying, and data collection. Students must collect well-organized and complete field notes with appropriate field sketches, metadata, and logs, which will be turned in and assessed. After students have implemented their survey, they will process the data using the Kinematic GPS/GNSS Survey Methods Manual. Although data were collected as a group, students are expected to provide individual analysis and interpretation of their data using the methods as outlined in the exercise. Students prepare a written analysis, answering provided questions that summarize their experience and knowledge on kinematic GNSS and its appropriateness to this study. Presentation: Basics of kinematic GNSS and post-processing workflow. Single pptx file for Units 2, 2.1, and 2.2. Student reading: guide for creating topographic surfaces from measured points such as kinematic GNSS data. Student exercise: students learn the basics of creating a 3D surface interpolated from GNSS point data. Covers several potential interpolation techniques. Pre-processed point data and supplements for the Unit 2.1 Exercise. Collected from the Salmon Falls landslide, Idaho, US. Note: It is encouraged to use data from a local site and collected by students if possible. See Teaching Notes on considerations for this. Summative assessment: students design and conduct a kinematic survey in order to create a topographic surface. TEQC is command-line software that can be used to Translate, Edit, and Quality Check GNSS data. Example field book layout suggested for students while taking notes for a GNSS survey. This unit requires kinematic GNSS hardware. We suggest one base station for the group and at least one rover per 5 students. All hardware should come from the same manufacturer for ease of instruction and data processing. Always have your hardware fully charged, professionally serviced, and recently field tested before handing it over to students. In-class hardware malfunctions are distracting and frustrating. If your school does not have kinematic GNSS equipment, you may be able to find colleagues who do or consider requesting support from UNAVCO, which runs NSF's Geodetic Facility. This unit is balanced between field-based and lab-based experiences. Students should be prepared (through Unit 2) to run a survey with minimal help other than the Methods Guide provided. During survey design, students will likely need some direction with how best to capture the local topography, but the final decision should be made by student groups. If revisiting a previous site with existing observations, ask the students to think critically regarding why the survey was designed the way it was and justifying whether this is the appropriate method. It is most effective for instructors to have coordinated the locations prior to teaching. Students should be given a site that provides them an opportunity to answer a scientific question with some societal relevance and that challenges them to think about various elements of survey design. This should include a few challenges such as line of sight, multi-path errors, limited sky and satellite geometry, etc. Students will likely need some assistance, but this should moderated. Students should be encouraged to work out problems as a group and make decisions. Work with students to make certain that their design is appropriate for the time you have allotted. With large groups or multiple pieces of equipment, two survey designs may be implemented or a single design can be repeated by multiple teams. This gives students an additional data set with which they can assess their ability. The best locations will have preexisting lidar so the students can compare their product to an existing high-resolution surface. Lidar data sources are listed below in Resources. Be sure to get landowner permissions. Students should be aware that GNSS surveys are about precision, and that includes detailed notes on metadata about the setup. Students must take personal notes about the equipment, survey design, and its execution to be successful. Students are encouraged to notate when they encounter issues and how they resolve them. An example of a field book setup may be provided to students and is available in the educational resources, but is only a guide and may be modified or substituted based on instructor preference. The spreadsheet style format can also be distributed to the students if they do not have field books or if the full-page format is preferred. One of the challenges of integrating GNSS surveys into a course with more than a few students is making sure that students stay engaged and mentally challenged even while they are waiting for their chance to participate in the data collection process. Students should also be encouraged to notate or map features of the survey area to ensure they can complete the data exploration portion of their assignment. Breaking students into small groups and conducting multiple surveys if multiple rovers are available is great. Most systems allow multiple rovers to operate with a single base station. An example field log is provided, and students are encouraged to fill this out or create their own. Metadata such as equipment type, manufacturer, and important settings should be recorded. Additionally, an equipment log is provided and can be used to engage students while they are not taking points. The data processing section of this unit requires proprietary software from the manufacturer of the GNSS system you are using, often meaning licenses are limited. This section of the unit can be modified based on resources available. If no student computers are available, we encourage the instructor to project their screen and walk through the data processing with students. The OPUS portion of the processing (processing base station position) is freely accessible on the web for students to practice. Once processing is complete, students should be individually responsible for completing the mapping assignment and interpretation of results. Group discussion is great, but students turn in individual work. A step-by-step guide for producing an interpolated surface based of the Topographic Exercise is provided and was written for ArcMAP 10.4 with the Spatial Analyst toolbox. If you do not have this software, there are free alternatives such as QGIS and others; however, you will need to adapt the guide as written. As in the section above, if software is a limiting resource, an example interpolation may be presented. Interpolated data is available for Salmon Falls Landslide, a location with a history of GPS and LiDAR surveys. The first exercise is a chance to demonstrate capacity to follow instructions and work with ArcGIS. Some questions will push students to consider which sampling and interpolation techniques work best in different environments. The formative assessment during the main assignment is observation of and discussion with students about the survey and can be done individually, paired, or in groups, depending on instructor preference. This should be done periodically throughout the process and helps gauge student understanding and weaknesses. Again, students should be encouraged to answer their own questions through deductive reasoning. Students will turn in their survey design, field notes and sketches, and a final write-up including figures showing their interpolated surfaces. The final write-up should demonstrate the student's cumulative understanding of kinematic GNSS systems, their applications, and techniques. A large portion of the grade should focus on the student's understanding of why the specific technique and design they used was appropriate for the question they were trying to answer and how kinematic GNSS improved the quality of the study over other methods. Students should evaluate the effectiveness of their survey design choices an propose opportunities for improvement in the final write-up. Note: In this example, students were ahead of pace, so in addition we calculated change (Unit 2.2, summative assignment) between two groups' independently surveyed surfaces. This allowed us to quickly teach an additional utility/skill and also ask questions about how the group's survey design differed and how this affected the resulting interpolated surface model. S. G. Bangen, J. M Wheaton, and N. Bouwes. 2014. A methodological intercomparison of topographic survey techniques for characterizing wadeable streams and rivers. Geomorphology. DOI: 10.1016/j.geomorph.2013.10.010. S. Bangen, J. Hensleigh, P. McHugh, and J. M. Wheaton. 2016. Error modeling of DEMs from topographic surveys of rivers using Fuzzy Inference Systems. Water Resources Research. DOI: 10.1002/2015WR018299. K. Schaffrath, P. Belmont, and J. M. Wheaton. 2015. Landscape-scale geomorphic change detection: Quantifying spatially variable uncertainty and circumventing legacy data issues. Geomorphology. 250: 334-338. DOI: 10.1016/j.geomorph.2015.09.020.